Elmer's father was a railroad man, and, shortly after Bertha and Elmer were married, the whole Kimsey clan moved to Rock Springs, Wyoming. There were 5 or 6 Kimsey boys, and I believe Elmer was the oldest (Elmer, Frank, Roy, Guy, Lyle and Earl). Not in that order, I am sure, but some of you should remember some of these men. The boys who were old enough worked in the coal mines in that area for a while, but soon the Mother, Etta, and the boys moved to Crook County to homestead. I don't know what happened to Mr. Kimsey, but I assume he died or was killed in a railroad accident. The Homestead Act was signed into law by President Abraham Lincoln on May 20, 1862. It gave an applicant 160 acres of undeveloped land outside of the original colonies. Anyone who had never taken up arms against the United States could file an application. They had to live on the land and make improvements to receive title. Children of Josiah Smith, Jr.
Elmer and Bertha and Etta Kimsey had adjoining homesteads, and the other boys (at least some of them) settled in other parts of the county. One of them, and I think it was Guy Kimsey, claimed a piece of property adjoining the one which Josiah Smith later bought (More about this news item later). I don't know when or where Bertha and Elmer's three children were born (remember I told about baby Donald earlier). 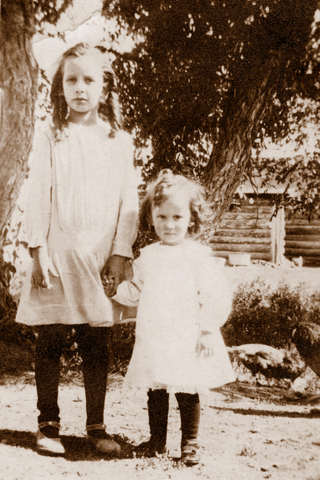 When my mother [Twyla Smith White] went to live with Kimseys for a year during World War I, Dorothy was about 6. 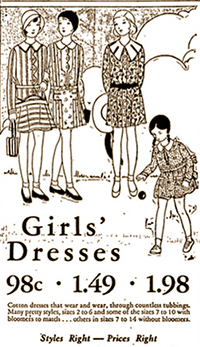 Twyla must have been 13 and the year about 1916 or 17. One of Twyla's responsibilities was to get Dorothy ready for School. Dorothy had very long hair, and Bertha wanted it parted and braided tightly. (Twyla claimed it was supposed to be so tight Dorothy could hardly blink her eyes!) Instead of sitting still during this procedure, Dorothy would let her head "follow the comb" which made things difficult for the hairdresser. One day Bertha saw what was happening, took the comb out of Twyla's hand, rapped Dorothy over the head, and finished the job herself. Twyla always said she marveled that Dorothy did not have a permanent dent on the top of her head. The girls rode a horse about a mile to the country school where Dorothy later began her teaching career. Twyla maintained that Dorothy delighted in kicking the horse to make it run. Then when she got home, she would complain of a side ache and blame Twyla. It will be interesting to hear Dorothy's version. While Bertha dearly loved her own children and grandchildren (and her nieces and nephews, I hope) I don't think she had any great love for children in general. Unlike Ethel and Twyla Mae and some of our family who never saw a child too smelly or dirty or noisy to pick up and love, Bertha and I were content to admire them at a distance. Bertha was a "neat freak" possessed of a very touchy stomach and a supersensitive nose. I'm sure it was not easy for her to change diapers and clean up messes inevitable with small children around. Bertha was a meticulous housekeeper and a terrific cook, qualities she handed down to both of her daughters. As an illustration, I will tell you about the outhouse at the ranch! I'm sure no cleaner privy ever existed. It was scrubbed so often with lye water that the boards were bleached white. They must have used quantities of lime, because unpleasant odors were minimal. And it featured a low, child size potty seat on one side. This outhouse figures in another Kimsey story which caused concern or amusement depending on the person you talked to. Mina Lee soon developed a cute little habit of returning to the privy whenever an unpleasant task (like washing dishes) needed to be done. Usually she would stay there until the chores were completed, but one day Bertha instructed everyone to sit down in the living room until Punk came back in. A much surprised young lady got to do the dishes that time. There are some who would say that she never completely got over that tendency to find something else to do when unpopular tasks needed attention. Aunt Bertha was a pretty good story teller and actress, and some of her best stories were the ones she told on herself. One of these was about the time she and Elmer were attempting to hang wallpaper. They would carefully measure, cut, paste and hang one strip of paper and by the time the second or third was up, the first fell down. I don't know how many times this happened before they discovered that they had mixed the paste from a box of pancake mix instead of the powder she was supposed to use. You can't really appreciate this story unless you can imagine the dramatic pantomime accompanying the recitation. Another time she was dreamily preparing breakfast for a gang of people, and somehow dumped about a dozen eggs in the cook stove and carefully deposited the shells in the skillet. Along the same line, she told me one time about starting to pick the dead leaves off her geranium plants and ending up by snipping every bloom and flower bud in sight. But the best story involved her transporting a gunny sack full of cats or kittens to or from the ranch. Now Bertha was not the very best driver in the entire world, and somewhere along the road, the animals got out of the gunny sack. Suddenly she had cats crawling around her feet and ankles, she had animals on her lap, on her bosom and shoulders and even on her head. She didn't even stop the car--just kept driving until she reached her destination. I suspect that in this story at least, Bertha may have let her Smith love for a good story embellish it a bit. In one version, she even had a bus load of tourists astounded by the sight! By the last time I heard the story, there were about 15 or 20 animals involved. That would require one big gunny sack! I loved to visit Aunt Bertha for many reasons. She was the only one I ever knew who had a rain barrel, and it was so nice to shampoo my hair in that lovely soft water. And she was the only one I ever knew who had feather beds. How I loved to snuggle down in them and sleep until I was ready to get up. No reveille for guests at Kimseys. Bertha and I both loved to read, and she always had a huge pile of magazines by her rocker. We spent lots of hours together with our noses stuck in magazines. While Bertha did not have a lot of beautiful things, she did have some lovely dishes. I was so thrilled when she gave me the beautiful wedding present cake plate I wrote about earlier. I treasured that for many years, and, when I broke up housekeeping six years ago and moved to this retirement home, I returned it to one of the Kimsey girls. I hope someone will always treasure it as I did. Bertha enjoyed playing cards more than anyone I know (a pastime I too enjoy) and I was sorry that my brother, Donald hurt her feelings by making fun of the "Jell-o and Hi Ho Crackers" served at nearly every card party. She should have forgiven him because he was just a smart aleck kid, but I'm not sure she ever did. I don't know just when Kimseys sold their home place and moved closer to town, but I'm sure it must have been a real treat to have indoor plumbing and electricity, and to be closer to their friends. We visited them many times at their new home, but it was never quite the same old familiar ranch house. I don't remember Bertha and Elmer ever visiting us, but I know Dorothy brought them to Spokane at lease once. I can't imagine where I was. Bertha really enjoyed going nice places to eat and I'm glad her daughters saw that she had some memorable times. I am hoping that Dorothy will add some information about her life and the lives of her sister, her niece and her nephew. World War I was a between the Entente and Central Powers alliances in Europe. On June 28, 1914, Archduke Franz Ferdinand of Austria was assassinated by a Bosnian-Serb and this activated alliances between all major European powers. The United States became involved in 1918 and the war ended on November 11, 1918. Wyoming was admitted into the Union as the 44th state on July 10, 1890. I can't write on my knee, but somehow I do it. Bertha was about 4 or 5 years older than I and always chummed with Grace more, so I really didn't know her till after she was married at 17 after moving to Wyoming and later to the ranch. I visited her several times as I was working and making a little money. Finally after many years she wrote me that she was pregnant and would like for me to come stay with her. She was never too fond of ranch life. I quit my job and stayed several months until the baby boy came, then I went back to Red Oak, Iowa for several months, but returned and was married. I really loved the ranch and western country. Bertha and I got to be quite close, but before that I hardly knew her. In fact, the 4 older kids were married young and I wasn't. So the 5 younger kids kind of grew up together. Bertha was never very strong and Mother protected her a lot, but that left the impression with me that Bertha was her pet and was liked better than me. That is kids for you. Until I was older and Mother told me why. I felt different about it. Red Oak is the county seat of Montgomery County, Iowa. I have truly enjoyed these books Maryon has written. I know it took a lot of time and thoughts, also case.??? When I read several of them I felt there wasn't enough praise given my parents, but today while think it over, I realized the younger generation didn't even know how thoughtful my parents were of their families. As a child it seemed to me there was always some of the Smith family living with us. First it was Aunt Twyla. It seemed my mother bought fabric by the bolt. When flannel nightgowns were made for Mina and me, they were also made for Twyla. Dresses and aprons the same. When an order was sent to Montgomery Ward for undies and shoes, she was included as family. She and I had lots of memories as we also rode to school together through all kinds of weather. Sometimes we squabbled as all children do, but we spent many hours singing and laughing. She was good to play card games with me, and also help me with my reading. But I remember my father helping her with her arithmetic. Then Aunt Ethel came. I was content to just sit and watch her comb her hair. She had beautiful hair and clothes. The bachelors flocked to our house. There were parties dancing and food. Many young people who later married met at our house during this time. Then Grandpa Smith [Josiah Allen Smith] came. He lived with us twice for long periods of time. Also my mother took care of him through his last illness which was prostate cancer. Mother was very fond of her father and they got along very well living together. He took lots of care of my baby brother Donald and was with us when he died. Then Grandmother Smith [Eliza Fox Smith] came to live with us if Grandpa wasn't there. She liked my mother, but I never felt comfortable around her. I think she disliked all kids but Donald White. During the years Grandma and Grandpa lived together, also Bryan 's and Aunt Twyla's children. Every time Daddy butchered a cow or pig, I knew we would be going over to see them. We took at least a third of the meat, a box or apples, squash and potatoes. My father raised a wagon load of big squash and pumpkins. If I got cold riding home from school in the latter part of September, I knew supper would be late as Mother and Daddy would be in the garden gathering everything that would freeze. If my father had working grading roads for the county, he would also ask for a job for Uncle Bryan. After Uncle Bryan moved to town, my father always cut an extra Christmas tree for them and for his mother, Grandma Kimsey. When Uncle Harry was sick, my mother sold eggs and cream so she could send a little cash to his family. I have always been very fortunate. I was never cold or dirty or hungry, but I was taught to share as they did. Aunt Bertha and Uncle Elmer seemed to go out of their way to be nice to me. Perhaps, because they had lost a son, Donald, in an accidental death from choking on a piece of bark. They valued children. When I was about 4 or 5 years old, Mother took me to visit Aunt Bertha in their log house on Arch Creek. Aunt Bertha had a woven gray green basket with about 6-7 apples in it sitting in the living room. It will be hard for the younger generation to appreciate the significance of an apple in Wyoming in the 1930s. Aunt Bertha and Mom had to leave the room for some reason. Aunt Bertha looked at me knowingly and said that I could have an apple. While they were gone, I took a small bite out of each one of the apples. When they returned, and saw that, Mother was furious, but Aunt Bertha only smiled and looked at me with love in her eyes. I was a big bawl baby up until about the age of 8. At about that age, Mom's relatives, three Jentoft kids visited us in the Country near Moorcroft, Wyoming. Aunt Bertha came to see us in their 1934 blue-green Ford Sedan. When she left, she agreed to take the Jentoft boys and Jack home with her to swim in Arch Creek and then they could walk back, a distance of 5 miles, but not me because I was too small to walk back. I started bawling, and immediately Aunt Bertha said that she would take all of us to her home for a swim and also drive us back. I like that. Uncle Elmer [Kimsey] was a smart man and always very friendly to me. When he had retired at Moorcroft and I was home from college, I met him on the street in Moorcroft. He invited me into Jess Fitchhorn's saloon for a beer. I accepted, and I could see that he was very pleased. 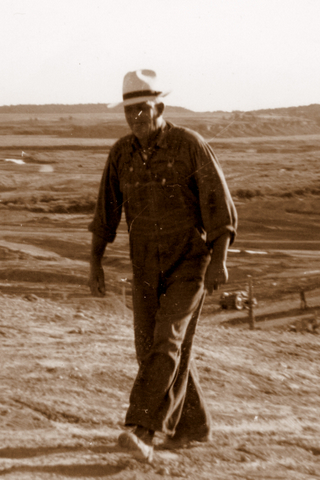 When I was about 10 years old (1935), I visited the Kimsey ranch by myself. I think Punk (Mina Lee) drove me there. Then she took me with her up to see her grandmother Etta, who we always called Grandma Kimsey, about ½ mile north on Arch Creek. At that time, the house appeared livable and neatly kept. It was a homestead house. Later at the clan Reunion in Sheridan (1982) I drove out to the old Kimsey ranch and to Grandma Kimsey's house. Uncle Elmer and Aunt Bertha's house had burned down. As I approached Grandma Kimsey's house, a huge deer bounded out of it. I went inside and examined the house carefully. I marveled how anyone could have survived the Wyoming winters in a house like that. These people were very tough. Settlers often built log cabins as their first homes. I had requested each book be sent to me after all others had written. In reading these shared memories, I would like to add a few of Great Aunt Bertha and her family. I spent most of my childhood in Moorcroft (moved to Seattle when I was in 8th grade in1964) and visited frequently at the Kimsey place about 1-2 miles out of Moorcroft. My memories of Elmer and Bertha were things: family pictures on the piano, very neat housekeeping, great food, horsehair (I think) couch and an old car. Uncle Elmer was great to take us little girls on a "tour" of the ranch, gathering eggs from the chickens and pet the milk cows. I also remember Aunt Bertha's funeral (my first). I remember staying in the "little house" that Mom wrote of earlier in this book. I'd also like to write a bit about "Punk" or Mina Lee. After I moved to San Diego in 1974 (?) Punk visited me here twice and we had a good time. She had attended Sweetwater High School here and we went in search of memories. I also stayed with Punk in Buffalo whenever I visited my Wyoming family and of course she worked at the soldiers home when Grandpa and Grandma lived there. Grandpa was very happy to have her there and I was grateful he had family close. She contributed a lot to my family and I thank her. San Diego, California was incorporated in 1850, the same year California became a state. The original Old Town was located several miles inland. In the late 1860s, Alonzo Horton promoted a move to New Town on the bay. New Town grew quickly and became the city center. In 1915, San Diego hosted the Panama-California Exposition. I have so many fond memories of my grandparents. My sister and I spent many happy summers and vacations at the homestead. It was a wonderful chance to run free. They put up with a lot and finally decided one at a time would be better. My grandmother Bertha was hard of hearing, but always knew when a car was coming up the drive. She also enjoyed her programs on the battery operated radio. My wife, Becky, my Aunt Dorothy Smith and I recently had a great visit with Bertha's sister Ethel Taylor. Her great wit and memories of family are amazing. She will turn 100 in August. I really don't have much to add. I do realize I have had a very good life. As a child, there was always food and love. As a grown up, I had two wonderful husbands, Verne Kirley and Robert Smith, also two great mother-in-laws. After I was married to Verne in Moorcroft, Mina Lee and I were very close and she spent many weekends with us. Also, my parents would come to town to supplies. Verne always told them to come to our house for lunch. This was a very frequent phrase with him, so I learned to cook in large quantities. I am fond of Mina's children. They are very thoughtful of me and try to come see me at least every two years. My brother-in-law, Alfred Smith has three daughters who are also very kind to me. A prairie is a temperant, level region with grasses, herbs, and shrubs, rather than trees. Most of North Dakota, South Dakota, Nebraska, Kansas, and Oklahoma are prairie. 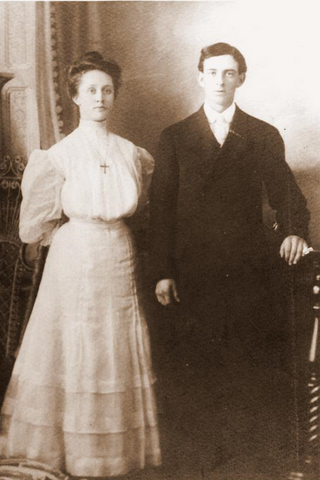 Bertha and Elmer Kimsey had a place in Moorcroft, Wyoming in 1929. We stayed there for several days, probably about 3 weeks in June, 1929 before going to a ranch in Arch Creek. I remember a birthday cake Aunt Bertha made for me on June 11, 1929. We moved to the ranch on Arch Creek (The old Summers' place) and Kimseys had the next ranch down Arch Creek. Taylors had a ranch up on the prairie between Arch Creek and Mara Creek. To me, Aunt Bertha stood out as someone definitely in charge. She had a piercing sense of humor, but everybody minded Aunt Bertha. She shared her magazines with us which were one of the few contacts we got of the outside world. One time, visiting the Kimseys, we had puffed wheat for breakfast. We talked about that for weeks. Nobody but Oliver Winbacks ever had puffed wheat. Because Dad and Uncle Elmer Kimsey worked a lot together, I have more memories of Uncle Elmer than I have of Aunt Bertha. Her clean and neat house always impressed me. I believe both Dorothy and Mina Lee (the Kimsey daughters) were my teachers for a year in the Pine Ridge Ranch one room schoolhouse. At that point in time, girl graduates from high school went one summer to normal school in Spear Fist, S. Dakota and then taught in a country school. I believe that my education with these cousins was many times better than is given now with all our modern approaches. The Kimseys, Taylors and Smiths were part of the heritage of an area and an era (depression years) and Aunt Bertha made a very worth-while and long lasting contribution. The Great Depression was world wide and originated in the U.S. with the stock market crash of October 29, 1929. Income, revenue, profits, prices, and trade plunged.. Unemployment in the U.S. rose to 25%. The negative effects of the Great Depression lasted until the end of World War II. My memories of my Aunt Bertha begin when I was about 3 or 4 years old (1934-35). A scene in the long narrow kitchen in the little log house by the creek. My mother (Vivian), Ethel and Bertha discussing Amy Cushner (She was French and was a WWI war bride) and how "she didn't even powder her neck." Bertha's remark was, I wonder if we do strange things in her eyes? I remember the confused feeling and curiosity I then developed about Amy Cushner. The smell of Coty's face powder always flashes Aunt Bertha's face to me. [I also remember] the magic of the davenport which made into a bed [with the] soft featherbed were the treat of staying "all night" at the Kimseys and the comforting sound of the chiming clock at night when I laid awake. I saw her infrequently during my teenage years. When I came home with my two little girls and had to live with my parents again, (which was very difficult for everyone) Aunt Bertha gave me moral support. A little house which wasn't being used was offered to me to spend weekends in to relieve some of the pressure of too many generations in too small of a house. Her sense of humor and sensitivity in an awkward situation were only two of her many good qualities. She was a meticulous house keeper and took pride in her own appearance. In her later years, I sometimes gave her home permanents or fixed her hair. I always looked forward to these occasions because she was such fun to visit with. In the 1830s settlers began arriving in Iowa from Ohio, Pennsylvania, New York, Indiana, Kentucky, and Virginia. Iowa became a state in 1846. I am one of 2 grandchildren of Bertha and Elmer Kimsey. When I think of my grandparents, I think of pioneers who settled the Wyoming range and built a log cabin. I remember stories of the trip from Iowa when they were a young married couple. They were married over 50 years when Bertha died suddenly. Grandpa had taken Bertha to town to buy a new dress for her birthday and left her at the dress shop while he ran errands. Someone came to get him when she collapsed while trying on a dress. A sudden stroke felled her and she did not regain consciousness. I suddenly realized that the grandmother who loved her children and grandchildren would never be there to give me her approval and love. It was the loneliest feeling I ever experienced. I can remember summer and Christmas vacations on the ranch riding our ponies, chasing chickens and generally upsetting the quiet of the ranch. Grandma, who was a great housekeeper, would allow me to make cookies. I can assure you we had more cookie dough on the floor than in the oven. During the depression, Grandma kept the ranch and livestock going while Grandpa went out on construction gangs to save their ranch. She was a dead eye with a gun and not afraid of any snake or critter found on the ranch. The heartbreak of her life seemed to be the loss of her only son, Donald Dee, at a young age. Donald got a piece of wood lodged in his throat and suffocated before they could get him to a doctor. He was named after Twyla White's boy who I understand died as a soldier. When my brother was born, my Mom promptly named him Donald Dee in honor of the other two sons of Bertha and Twyla. Grandma loved the family and never listened to any excuse for not attending family holidays or reunions. She genuinely liked visitors and would rush around the house when a car drove into the ranch, trying to locate her teeth, glasses and hearing aid. The best times I ever had were sitting quietly and listening to Bertha, Twyla, Bryan and Ethel tell their stories. They were full of humor, sadness and history. Christmas and Easter were very special on the ranch. At Christmas, Grandpa would cut a fresh tree and it was decorated with popcorn, berries and homemade decorations. Easter eggs were dyed and hidden with care and the egg hunt was supervised carefully to make sure the grounds were clear of snakes. I always felt very loved when around my grandparents and still look back on those days with happiness. I remember taking a trip through Wyoming on the way back to Sioux City. We made a stop at Bertha and Elmer's. They took us on a tour of the homestead and Devil's Tower. Elmer told us to look over yonder and we would see some antelope. We stayed the night and my husband, Jack, was up half the night. Every little sound he would imagine there was a snake in the room. Bertha told him they wouldn't hurt him, but that didn't convince him. Mina Lee came to see us with the intent of finding work. She stayed about a month and when we came home from work, she was already home. She did some calling, but never went to see anyone or put in an application. Jack said you don't find work that way, go see the person. The next day she decided she would go back to Wyoming. Elmer and Bertha came to Portland when the Larsons and Whites were here for a sort of reunion. The men liked fish so I baked a big salmon. They ate most of it as this wasn't the ladies favorite food.